We hope everyone had a very Merry Christmas. 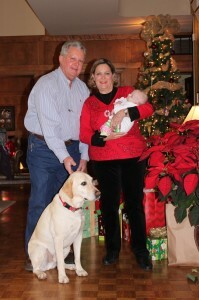 It was certainly a special Christmas for us as Bo and Janie celebrated the Christmas season with their first granddaughter, Harper Jane Miskov, who is only two months old. Without a doubt the gift of life is the greatest Christmas gift of all. Next week Bo is off to the Patagonia region of Chile in South America. Patagonia offers some of the best dry fly fishing for big Brown Trout on the planet with the added opportunity for King Salmon at the Cinco Rios Lodge (http://www.cincorios.cl/english/index.php) on the Simpson River. Bo is also going to check out Estancia de Zorro (http://www.estanciadelzorro.cl) as the group on this hosted trip will fish a different river or stream every day of the trip. Plus the last two days of the trip they will be touring the Chilean wine country and other cultural attractions of Chile. It is not all about catching fish! Also, Bo’s good friend from Heber Springs, Arkansas, Chuck Farneth, will be in Patagonia with a U.S. team competing in the World Masters Fly Fishing Championship in Coyhaique, Chile. You can keep up with this exciting competition at the events website:http://www.wffc-chile2014.com/en/. This is going to be a great trip and we already have an album ready for trip photos in the Gallery section of the website. Bo will try to do a few posts from Patagonia but he will have lots of photos and a full report when he gets home in late January. Sure wish I was getting to go but I have to stay home and watch over Harper Jane. If you are interested in one of our hosted trips just contact us at Empty Creel Fly Fishing Guides and Outfitter and we can tell you about hosted trips in 2014 which will hopefully include Brazil and Peacock Bass. Best wishes to all for a Happy and Healthy New Year.